It’s funny. At my last day job I worked at a small company of 30 employees. During the time that I worked there they went from having no dress code to the strictest “business casual” dress code of any place that I have worked. Now I work in a large corporate environment. I think there are around 600 employees at my location. The first week I was here they downgraded the dress code and I have have been able to wear jeans to work every day since. Aww! Biff can do better than that. D: Why does his nametag say “Jerk”? Because when a Sucky Customer tries to get him fired by calling the owner (that they happen to be best friends with but couldn’t pick out of a lineup) because their McWhopper Delux without pickle, extra mayonnaise value meal wasn’t ready five minutes before they ordered, all they will be able to say is that a big Jerk served them. Hey, Jerk behind the counter! I’ll take a Baconator combo with fries and Sprite. Thanks, Jerk! Have a nice day. Is Biff a soda jerk? I thought those were pretty rare jobs to come by these days. Maybe soda jerks jerk hamburgers now instead of soda handles. Also, my company says we have a dress code, but we don’t really seem to follow it. Our casual Fridays have evolved into casual everydays. Yay jeans everyday! Ooh, Jerk! I’ve eaten there before! It’s pretty good, though the food can be a little on the greasy side. Nice comic going on. I’ve been quite a silent follower.Though everything has been great and I’ve not much to complain, some of the feeds have been skipping new comics.Soaks was not in my rss feed.Hope you can fix it and keep Biff alive without a hitch.All the best to you Chris! My old job was extremely casual until one of the managers messed it up. She was an absolutely gorgeous redhead until she got dumped by her boyfriend (they’d been dating only three weeks). Afterwards, she put on about 50 pounds in the next two months. Unfortunately, she didn’t buy new clothes, so she would show up in spaghetti strap tops and shorts, in which she’d be “oozing” out the sides and stuff. Management instated a dress code strictly to stop her from doing it anymore. I like my job. Or rather, the job that I had and that is waiting for me when I return to Canada. No dress code to speak of, though showing up in something revealing would be a bad idea from a safety standpoint. Yay for playing with fire, sharp objects, and heavy chunks of steel. If I were back in fast food service, they’d *have* to title me as “Jerk.” I’d vent my spleen on anyone with a dumb question, which means pretty much everyone. a uniform. We’re all jerks… or strange. Nice to see Steve Martin’s old costume is getting some use. Haha. My school tries to get us to wear school uniform. Which consists of black shoes, black trousers, white button shirt, and black jumper. 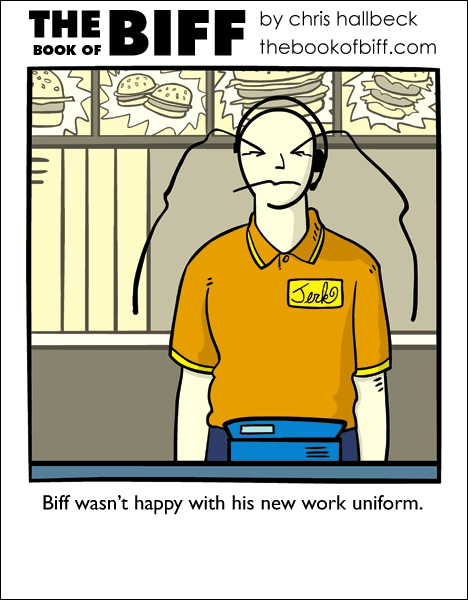 Biff must hate his boss. I have to wear a mask at work. lol, some ad for ‘diva village’ that was Feel Beautiful popped on the Biff footer ad. I know what you mean. You sound like someone I’d be friends with. It’s a little late, but, thanks for clarifying that, Dragonbrad. That kinda happened to a friend of mine. His last name is Powers, so they gave him a name tag that said “Austin”. Is Biff’s full name Biff Jerk? Or Jerk Biff? “…Would you like an apple pie with that?